On July 7 in Shibuya, Tokyo, Catherine Jane Fisher stands net to her art exhibit, Nuchi du Takara. 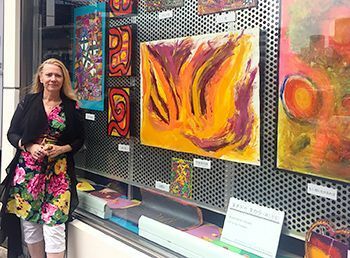 Catherine Jane Fisher is holding an art exhibition meant to transmit the messages of peace and love, titled Nuchi du Takara (Life is a Treasure), in Shibuya, Tokyo. Fisher is an Australian and a resident of Tokyo who protests U.S. military crime and is calling for revision of the U.S.-Japan Status of Forces Agreement (SOFA). Prior to the commencement of soil depositing work in Henoko, which is set for August as part of construction of the new base, she whole-heartedly hopes to draw many people’s attention to Henoko from the middle of the city. The exhibition will be open through July 31. Fisher’s exhibition is visible in the window of the art supply shop Uematsu, located right by Shibuya Station. Her works titled Phoenix and Henoko are both multicolored yet have red as their base tone. Throngs of people pass by the shop, and people have been observed taking notice of Fisher’s paintings. In 2002 a U.S. soldier raped Fisher in Yokosuka City, Kanagawa Prefecture. Based on this experience, Fisher makes continuous efforts to support victims of sexual assault. Immediately after suffering this experience, her works largely became darker with more use of black. She has expressed her desire to never make works that gloomy again, and she does not want to allow crimes like this to happen anymore. Furthermore, she insists that until the U.S.-Japan SOFA is revised crime in Okinawa will not change at all. Fisher has her reasons for pursuing such action. She feels she has a duty for the sake of her grandchildren and the coming generation. If someone were to ask her why she did not simply do nothing she would be at a loss for words. With these thoughts in mind she continues to create her works.